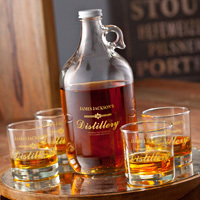 The personalized distillery growler set includes 4 printed low-ball glasses and one 64oz whiskey growler. 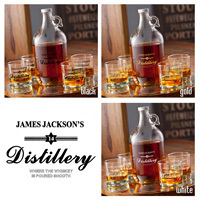 Perfect for your whiskey connoisseur. Printed by hand with a classic brewery design in one of 3 ink colors and personalized with one line of text; up to 15 characters. 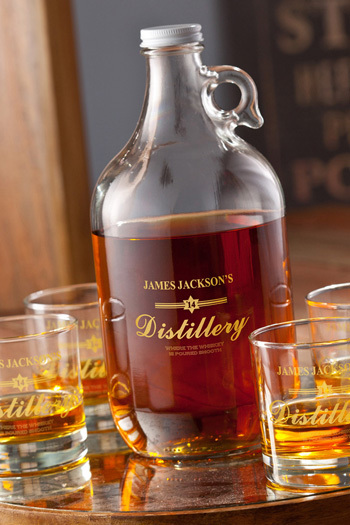 Design says: (personalized name) / Year / Distillery / Where the whiskey is poured smooth.